Once again the alarm clock went on at 3:15 am. 4:00am. With the punctuality the spaniards attribute to the british I was saying "good morning to Pete". A bit before 6 am we arrive to Hailsham. 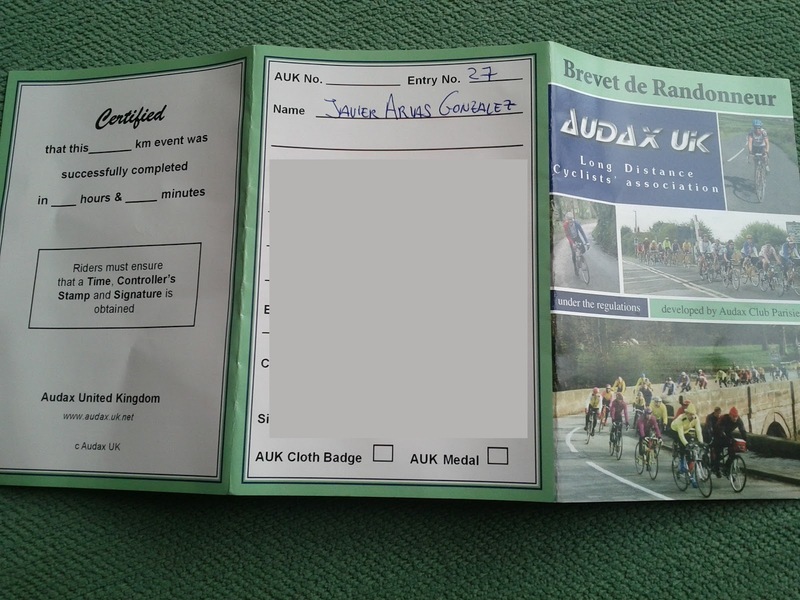 We are going to take part of a riding event organized for who looks like an institution in this not really rational world of the long distance ride: David "El Supremo" Hudson. "El Supremo" in Spanish means literally "The Supreme", I wonder why David is "El Supremo". We didn't even start to ride and it started to rain. We went on our bicycles and rain intensified. We were riding just for a few kilometers and it was raining A LOT! 17K. First control. We just had to take note of the time. 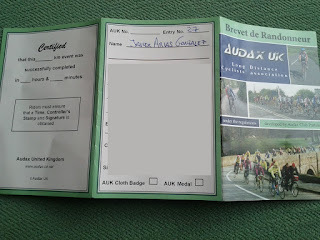 I take mental note, I don't want to get my brevet out, it would get wet. At some point after the kilometer 17th it stopped raining. Very timely moment that Pete chose to get a punture in his rear wheel. Pete know when to do certain things. 67K we learnt Warminghurst church's door is made of wood. Interesting fact! We were riding at an easy but constant pace; we very rarely stopped and that makes the kilometers to go away quickly. In the middle of a national trust park he set up a camp where was offering to cyclists sandwiches, cakes, biscuits, energy bars, coffe, orange juice. A dream made true. There were even chairs!! It was 10:15. 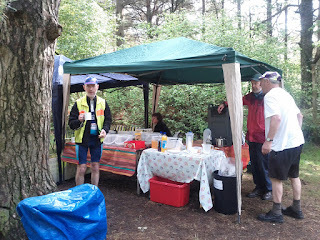 As I had had breakfast a 3:15, seven hours before, and we had rode 90k already I got to the conclusion that it was the right moment to eat one of the two portions of pasta salad I was carrying in the bicycle. Well a portion or pasta salada and two pieces of cake and an orange juice among El Supremo's offer. 102K We learnt the name of that house at Burinton is Burinton House. Easy one! We are entering Alresford and Pete asks if I remember the town. Sure I remember. It is one of the towns we visited when we rode the 300. We have to get a ticket from the very same Tesco Express. Its 13:15, which means we are 2 hours and a half ahead of the time limit. We are at the 146K, good feelings. On of the cyclists, I think she was the only female that took part in this event, was sitting on the sidewalk and eating cheese. Uhm cheese! She said, don't buy any cheese I have plenty here and I don't want to carry it on the bicycle. So I bought two fruit salads and ate them with two slides of cheese. Not really orthodox but it was want I wanted. We went on the bicycles and not even 7K later Pete gets his second punture in the rear wheel of his bike. Luckily this time we managed to find that "fully embebed pebble if-you-don't-find-me-you'll-have-to-change-the-tyre". We are now reasonable sure we have solved the problem but still we take mental note: if we see a bike shop we will stop to buy inner tubes and possible a tyre. This was the moment when we were riding the most beautiful part of the route. Some cyclists came riding quite fast in the opposite direction. I thought they were the riders at the front of our route so I commented to Pete we might have to ride back on those roads. I'm glad, it's an almost flat road with a beautiful scenery. 201K. This is the confirmation that David is definitively "El Supremo". He is waiting for us at the edge of a roundabout with the camp installed. 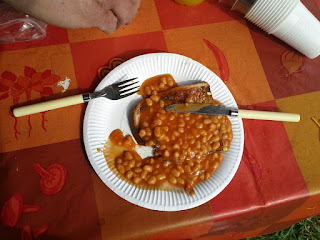 Food, drinks and beans on a toas. HOT! cutlery included. Really impressive!!! The cyclist that gave me the two cheese slices asks me. Where abouts are you from?. From Spain, I answered. Oh, we got it wrong, we were wondering if you were Italian or German. Just the confirmation that my accent is not improving. it just gets more confusing. At the time of getting the stamp I was told there are 41 cyclist running the 400K and 16 the 200K, I had no idea there was a 200K running at the same time. Well, we are half way and once you get this point I guess we all try to do the same. Forget about you have rode and try to convince your body that you are just starting a 200K ride. I tried my best and I would say I was pretty successful. It's 16:24, we have been riding for 10 hours and 24 minutes and we are half way. Don't ask me how but I got to the conclusion that we will finish around 2am. Two hours ahead of my plan. And that having in mind that not everything was all right. At my Google Buzz I reported (in Spanish): "200K, everything all right but we still have 200K to go, we will ride 100 of them in the night, it seems it is going to rain and I'm a bit tired." And still I, maybe to optimistically, thought we were going to finish around 2am. We got on our bikes and at the first turn we realize we are not going to ride back on the same roads. Those cyclist might be taking part of the 200, which explains why they were riding so fast. 236K. The pub at the end of Stockbridge is called The Vine Inn. Not sure if it was a fluke but soon after that it started to rain. And the rain was heavy enough and it was cloudy enough to make us 100% sure it wasn't going to stop any time sure. So we decide to stop and dress for the occasion. I put on my shoe covers, arm warmers, leg warmers, vest, globes and raincoat. We turn on the lights and we set off. Less than 37K to the next control, it took us less than two hours but the rain didn't stop. 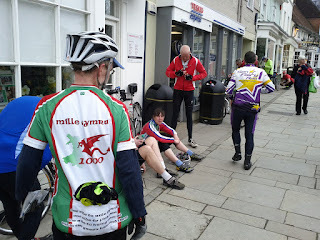 By the time we got to the Esso petrol station in Petersfield we were drenched and frozen to death. When I saw the cafe I thought "I hope the have hot chocolate". It was the perfect opportunity to eat my second portion of salad pasta; also a hot chocolate "grande" and an almond croissant. It's 21:08 we were at kilometer 283. I do my calculations and got to the conclusion, not really sure how, that we will finish around 4am, just as originally planed. This is what I report at my Google Buzz to whoever is interested. Despite the hot chocolate I was still shivering, outside it was raining and it was dark. It's not I was being lazy, it was I was afraid of going out. And I shouldn't, incredibly it has warmer outside than inside the cafe. It's a shame that outside it was raining. Next control is in 60K, and it took us almost 4 hours to get there. We are safe if we say those weren't the best conditions for cycling. The control was at a service area cafe. It didn't matter it was 1:09, we had to get a ticked so I went for a hot loin (I think it was loin) sandwich and it was really good. Thinking about it now I realize the whole setup was a bit surrealistic. We were around 10 cyclist in a cafe that otherwise would be empty. 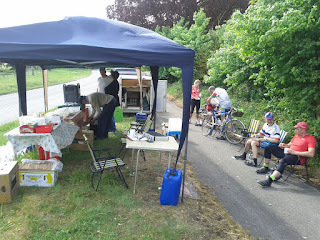 Some of the cyclist were sleeping in a corner. Someone (not cyclists) was playing at the slots machines. On the tv the news were saying that Seve had passed away. When we were walking out of the cafe three women of distracted moral said something to us, not sure what but I didn't need to understand them to know the answer was "no". As I said, everything a bit surrealistic. Lets set off. We have 50K until the next control. 55K until the end of the route. The rain has stopped and a cyclist (I don't remember his name) is riding with us. From the very beginning he said, don't wait for me if I can't keep the pace, your are faster than me. We were not riding fast, quite the contrary, at the first slopes he began to fall appart. And pretty soon the one that was falling appart was me. I was falling sleep. Literally I was falling sleep while I was pedaling. I thought that was not possible but the fact is that for a second I closed my eyes and the next second I woke with a shake. It should not be a surprise. 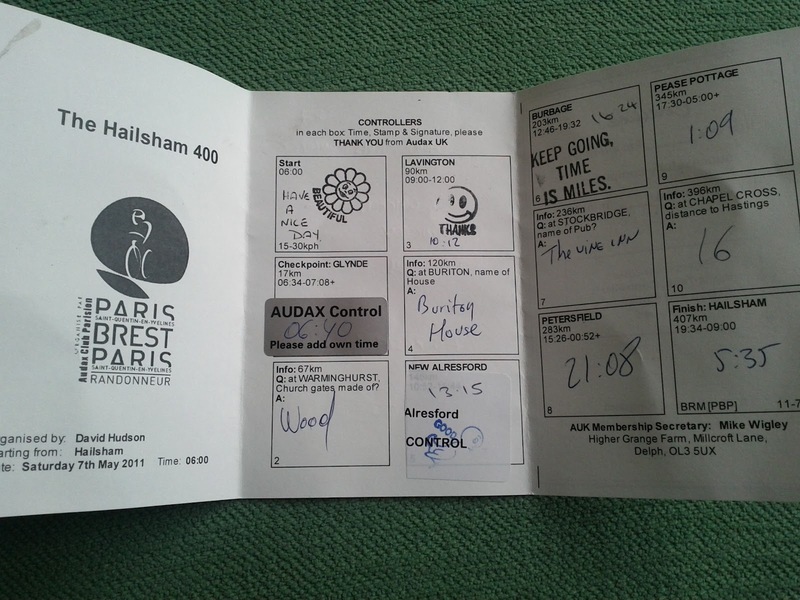 I was awake for 24 hours, most of them pedaling in the bike and as at the 200 and 300 I had not had any te, coffee or redbull. I have to stop if I don't want to fall off the bike. I let Pete know that I'm stopping but I ask him to keep it going, I'll catch up with him in a minute. Lets pee; I'm starting to feel better. Lets eat an energy bar; I'm feeling much better now. The cyclist I don't remember his name passes in front of me. I still take my time before I get on the bicycle. I'm feeling much better now but to feel better I think I have to activate a bit my body. My heart rate is at 80 and I guessed (not a single medical argument to stand that guess) that was why I was falling sleep. Done! I get on the bike and start pedaling full power. It's a sprint. Physically I'm feeling great so I get some speed. 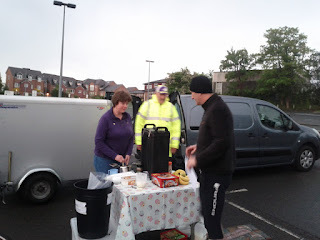 I took over the cyclist with no name and by the time I reached with Pete I was feeling fully awake. Let me set something clear. It is not that we didn't know were we were (although I didn't know where I was for most of the route), it is just that we were looking for a right turn and we couldn't find it. It had to be there, but we were not sure where. We lost some time riding up and down the street trying to find that turn. Finally, after checking with mister Google Maps, after considering it was 4:45 am and we had 396 km in our legs and after reaching to the conclusion that 600 meters downhill were better than riding 2.7 kilometers back to the previous turn we took a turn. And it was the right one. Well maybe not "the" right one, but it was a right one. After 600 meters downhill praying we reached a sign post announcing that if you wanted to go to Rushlake Green you had to turn left. That's the sign post we were expecting. We were back on track. The road goes downhill for a bit, is dawning and the birds are singing. Pete says he recognizes this part of the route so we are not lost. All is full of happiness. Riding very genteelly we got to the end of the route. Another cafe in another petrol station. Several cyclists that we thought they were behind us were there, including the cyclist that gave me to slides of cheese and the cyclist with no name. They were not lost in that right turn. To get the ticked I end up buying spicy doritos and maltesers. It was what my body wanted and I was not in a position to argue with my body. Pete's body wanted and ice crean and he didn't argued with his body either because he ended up buying and eating an ice creame at 5:35 in the morning. Almost four hours and a half to ride the last 62K. I wonder why I insist in making plans, calculations and estimations. They are useless, you will finish at the time you will finish and that's it. We still had to ride 3 additional kilometers to get to where the car was parked, but that was easy. We got to the car, put the bikes in and set off. I drive. We had to stop three or four time (I lost the count) on the left hand side of the road because I was about to fall sleep in the car. Each time we stopped I went out of the car so the rain and the cold could wake me up. I don't remember how long took us to make the 1:30 trip, I don't really care, it was stopping or risking having an accident. Easy, we started to talk about the best way of riding the 600K without caffein. Will we have enough time to sleep in a bed? When is it better to stop to sleep? Should we book in a B&B or is it better to decide on the go? How does this fit with the strategy for the Paris Brest Paris?. Those good things to get a long distance cyclist wannabe awake.